The St. George’s College staff and community mourns the loss of the former Dean of St. George’s College, the Revd. 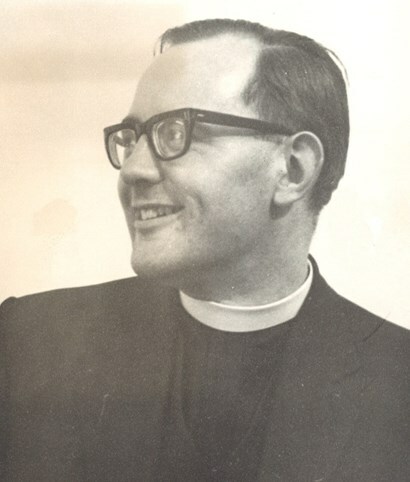 Canon Dr. John Wilkinson, who passed away on January 13. John began his career at St. George’s College in 1961 as a tutor and subsequently became Dean of the college from 1969-1974. In addition to his Biblical scholarship and teaching excellence, John played a key role in supervising the construction and design of the college building that is used today. The cornerstone visible on the eastern facade of the building was designed and installed by John in 1962. Besides his legacy in the role of Dean and leader within the St. George’s Cathedral close community, Revd. Wilkinson was awarded a Ph.D. from the University of London and the Courtauld Institute of Art for his research dissertation entitled, “ Interpretations of Church Buildings before 750.” Whilst serving as Dean and in the subsequent years when he frequented Jerusalem, becoming the Director of the British School of Archaeology in Jerusalem, John was still a familiar presence in the worshipping life of the cathedral close; Revd. Wilkinson became a canon of St. George’s Cathedral in 1973. Without a doubt, it was Canon John Wilkinson’s vision that laid the foundation on which St. George’s College is built today. For those of us who knew John, we knew him as a scholar, educator and a dedicated priest who cared deeply about giving clergy and laity a profound appreciation for the bible, the land, the historic churches and the peoples of the land. Thank you John for being an inspiration to all the Deans (as well as College staff and course members) who have followed you. The Revd. Canon Dr. John Wilkinson was preceded in death by his first wife, Alexandria McFarlane, and is survived by his widow, Mzia; the St. George’s College staff and community send our heartfelt condolences to the family and friends. John’s impact on the college academics, leadership and affection for the local Christian community will be remembered with admiration and gratitude for his years of ministry herein. We are grateful for the contributions of the following former deans and their permission to include them in this memoriam. The Revd. Dr. Stephen Need and The Revd. Canon John L. Peterson. Photo from Church Times, 16 Feb. 2018.